Browse the entire archive of "Latest News at Glendon"
In September, in honor of Suicide Awareness Month, Glendon hosted live and online events to help empower individuals and our community with the tools and resources needed to help prevent suicide. Glendon launched National Suicide Prevention Month with a bilingual educational forum and film screening focused on mental health awareness as well as the risk factors and warning signs of suicide. This public community event was held at Goleta Valley Community Center with more than150 people in attendance. The forum included a film screening of the documentary Ebb and Flow followed by a Q&A with the award-winning filmmaker Sasha Gay Lewis and suicide attempt survivor Anthony Rodriguez, telling his story of hope recovery and resilience. The evening also featured a panel of local expert mental health professionals and educators and an extensive mental health resource fair. Glendon partnered with American Association for Suicide Prevention for the 5th Annual “Out of the Darkness Walk.” The walk brings together those who have lost a loved one to suicide and also engages people with local mental health resources. There were more than 300 people in attendance. The walk also featured more than 25 mental health agencies at the annual resource fair. 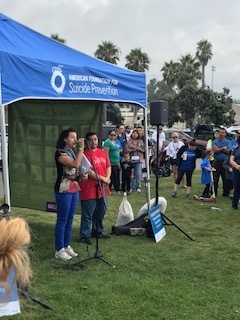 It was an inspiring and moving event with talks from suicide survivors and suicide attempt survivors as well as dignitaries, including Santa Barbara Mayor Helene Schneider and Sen. Hannah Beth Jackson. Glendon also hosted two Webinars on suicide prevention. The first Webinar, “Effectively Saving Lives“ with Dr. John Draper, Director of the National Suicide Prevention Lifeline 1-800-273 TALK (8255), had hundreds of attendees from around the country and around the world. The second Webinar presented by Dr. Madelyn Gould entitled “Is Suicide Contagious?” examined the nature of suicide clusters and contagion and the role media play. 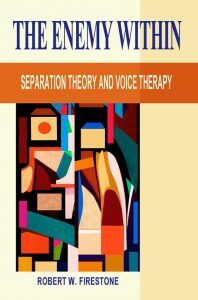 The Glendon Association, in conjunction with Zeig, Tucker, & Theison, Inc. Publishers, is pleased to announce the launch of Robert Firestone’s new book The Enemy Within: Separation Theory and Voice Therapy at the Evolution of Psychotherapy Conference in Anaheim, Dec. 13-17, 2017. The Enemy Within is a compendium of the life work of Glendon’s principle theorist, Robert Firestone. The book builds upon his previous published works and offers an in-depth exploration of his more recent findings. The result is an original, holistic approach to understanding human behavior, relationships, and crucial socio-political issues. The Enemy Within provides new insights into the destructive thought process or “voice,” particularly in relation to its insidious influence on suicidal and violent behavior. Using compelling case examples, Dr. Firestone shows how the techniques of Voice Therapy help clients separate from the critical inner voice and fantasy bonds (destructive emotional ties) that are limiting their lives to a considerable extent. The book highlights the profound impact that the fear of death has on all of us, largely on an unconscious level. This deep-seated fear reinforces a tendency to conform to the beliefs of a particular group and to subordinate ourselves to charismatic leaders. The resulting in-group identification polarizes us against people who look, believe, or act differently. Dr. Firestone’s thesis is that this collective defense or mindset contributes significantly to the problems of racism, terrorism and ethnic warfare. The Enemy Within is a thought-provoking, valuable, and timely contribution to psychotherapy, psychology, and the other social sciences. “A milestone of incisive, illuminating and practical guidance to the core of therapeutic healing, as well as cultural healing…in my view. I found the book to be an invaluable distillation of the best thinking in our field.” – Kirk Schneider Ph.D.
“A commanding articulation of Separation Theory and Voice Therapy in the service of fostering ‘life-affirming death awareness’ by one of the most influential theorists and clinicians of our times.” – Sheldon Solomon, Ph.D.
“Thank you Robert Firestone for this comprehensive, practical and precious work identifying The Enemy Within and providing clear strategies for addressing resistance in psychotherapy, but more important, our own resistance to a better life.” – Pat Love, Ed.D. Sign up for Dr. Siegel’s latest presentation on the mind.